NYC Express Bus provides affordable express bus service to and from all NYC airport terminals, with transfers between JFK or LaGuardia (LGA) every 30 minutes and buses that travel to the heart of Manhattan. 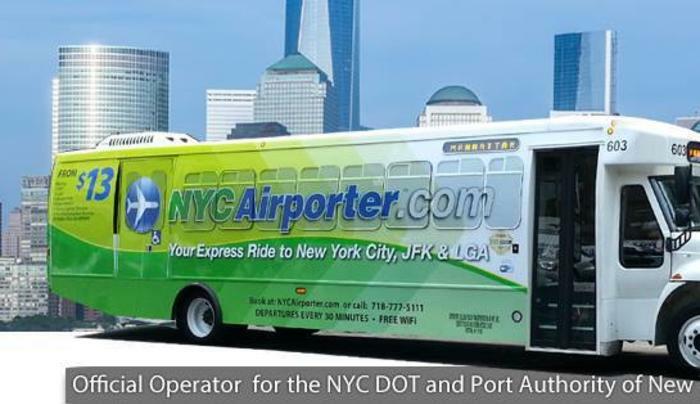 They also offer service to Newark Liberty International Airport (EWR) in New Jersey, which requires a bus transfer to Newark Airport Express' bus service at the Port Authority Bus Terminal. The NYC Express Bus also offers charter service with free meet-and-greet at their conveniently located counters outside baggage claim. The buses offer free WiFi, climate-control and outlets to charge your phones, laptops and tablets.